ASUS has apologised for delaying the Android Pie Update for Zenfone Max Pro M1, Max M2 and Max Pro M2. The company has promised that the update will arrive in less than a month. So far, ASUS hasn’t disappointed in terms of regular updates, but the same cannot be said about OS updates. Last week, we wrote about the March Update for the Max Pro M1, which brought the February Android Security Patch. I think it is worth mentioning that the update arrived before it was released for the Max Pro M2 and Max M2. 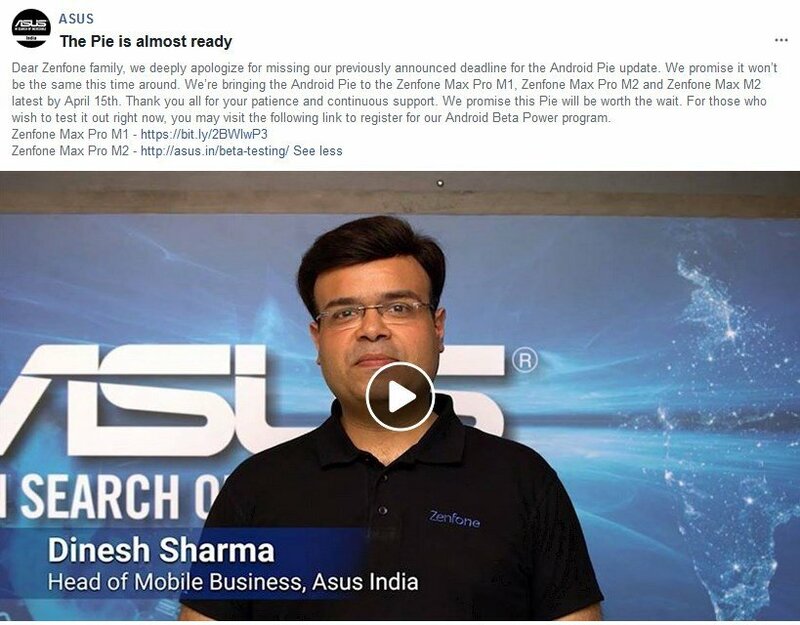 Dinesh Sharma, Head of Mobile Business, ASUS India, mentioned in a video uploaded to the company’s Facebook account, that the reason for the delay in releasing the Android Pie Update for Zenfone devices, was due to some bugs (though he didn’t mention what they are). This isn’t exactly news, since several users on the Zentalk forums, who have tested the update have reported many bugs in the Android Pie Update for Zenfone Max Pro M1 and Max Pro M2. Personally I use a Zenfone Max Pro M1, and the delay in the update’s availability, is no doubt, disappointing. Bugs in the Pie update reportedly include no way to enable Camera2API, Idle battery drain, decryption/root issues, etc. Nobody wants a buggy update, so a polished and stable version is perhaps worth the wait. And to be frank, I’m glad that ASUS is continuously supporting the device, and acknowledges that the delay in rolling out the Pie Update has not been well received by users, let alone promising to address it soon, instead of ignoring users completely. You can sign up for the Beta Program of the Android Pie Update for Zenfone Max Pro M1, and Max Pro M2, to help ASUS by providing feedback, and iron out the bugs in the OS. My only concern is whether ASUS will update the Zenfone Max Pro M1 to Android Q. During the launch of the device, Dinesh had stated the company’s “strong intention to provide 2 years of OS updates”. Only time can answer that question. For now, we have to wait until April 15th, for the Android Pie Update for Zenfone Max Pro M1, Max M2 and Max Pro M2.